Some of the major companies in the global medical aesthetic devices market are Alma Lasers, Merz, Inc., Cutera, Inc., Allergan plc, Cynosure, Inc., Galderma S.A., Solta Medical, Inc., Syneron Medical Ltd., Mentor Worldwide LLC, Lumenis Ltd., and ZELTIQ Aesthetics, Inc. These players are set to bolster the growth of the medical aesthetic devices market in the years to come. According to the analysts at Zion Market research, in 2015, the global medical aesthetic devices market was capitalized at almost USD 6.50 Billion. 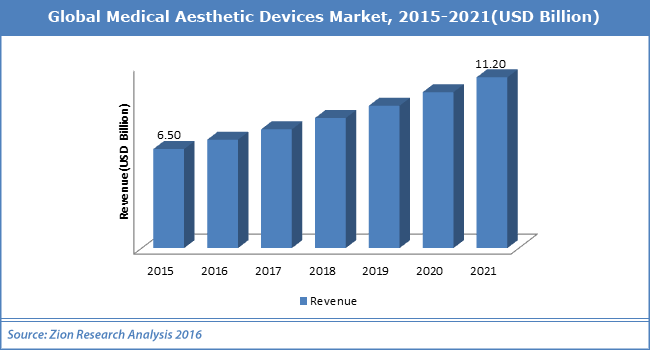 The global medical aesthetic devices market is anticipated to cross almost USD 11.20 Billion by end of 2021, developing at a CAGR of almost 9.5% from 2015 to 2021. “Rising acceptance of minimally invasive operations in dermatological applications paired with rapid increase in population between the age of 30 and 60 are major factors planned to be major demand boosters in the medical aesthetic devices market,” claim the analysts Zion Market Research. This, in return, escalates the demand of dermatological applications in Asia Pacific market. This is providing new development chances for the global medical aesthetic devices market. On the other hand, the high price of treatment is anticipated to be the major limitation for medical aesthetic devices market. In addition to this, technological enhancements will offer innovative items and might open up new growth opportunities in the coming years. For example, in April 2018, Salient Medical Solutions rolled out new facial skin analysis system that employs skin care photographic imaging tool. The device offers clinical calculations of subsurface and surface facial skin conditions by using digital images techs through PL polarized light, RGB visible light, and UV spectrum. This launch of the new device has enhanced the development of the medical aesthetic devices market. The medical aesthetic devices market was led by North America with the share of over 40% in 2015. This area is anticipated to carry on its supremacy in medical aesthetic devices market in the coming years. The attendance of a huge base of major players in this area paired with technological improvements is anticipated to assist the region to maintain its dominance in the global medical aesthetic devices market in the years to come. Europe was one more leading regional in the medical aesthetic device market. This development is primarily due to unremitting technological enhancements in the aesthetic device. On the other hand, the Asia Pacific area is hoped to develop at the fastest CAGR between 2016 and 2021. Rising disposable income paired with biggest population pool aged from 30–65 is creating demand for aesthetic therapy particularly in India and China.